Get dinner on the table in just 15 minutes with this tasty dish. 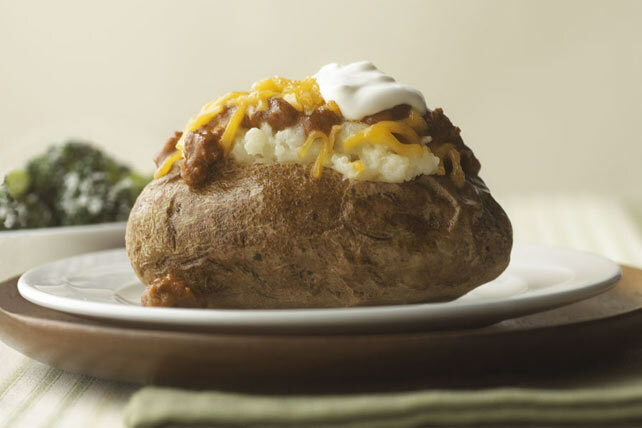 Heat baked potatoes in the microwave, then top them with chili, cheese and sour cream. Place potatoes on microwaveable plate. Prick in several places with fork. Microwave on HIGH 8 to 10 min. or until tender. Meanwhile, heat chili as directed on label. Cut crosswise slit in top of each potato. Fluff centres with fork; top with chili, cheese and sour cream. Garnish potatoes with chopped fresh dill or green onions before serving.